PANORAMIC LAKEVIEWS! 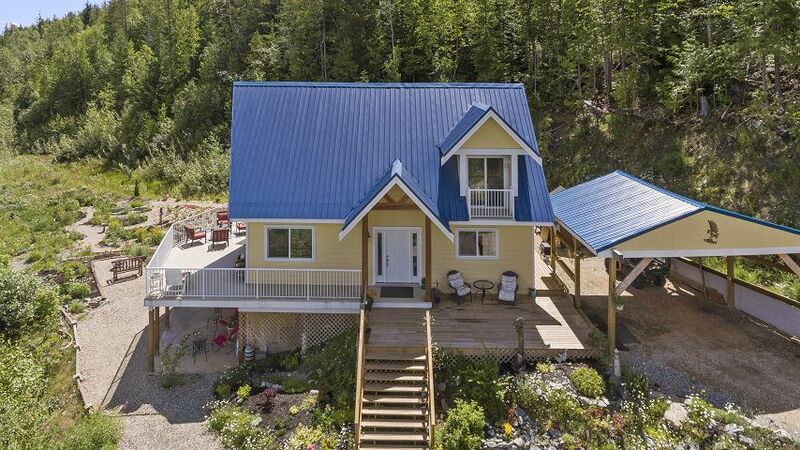 This is the real Shuswap dream property with 180 degree panoramic views of the Shuswap Lake perched above Eagle Bay on your own very private 20 Acres! Like new, 5 year old 3 Bedroom home professionally built with towering great room windows that soak in all the views. Custom built by renowned builder LaVista Homes, there is a mixture of modern design with a cabin retreat feeling. Vaulted white washed wood ceilings, grey tone decor, custom cabinetry kitchen with glass tile backsplash. One bedroom on each floor with the master retreat in the loft along with a soaker tub ensuite & private balcony. Completely finished walk-out basement with open concept bedroom area for guests. Main floor laundry & mud room entry off carport. Professionally installed gravel driveway with proper drainage ditching; Underground electrical service from road pole; Awesome drilled well & Health Canada approved septic system installed by Rhino Environmental Services. Everything is top notch! Only a couple minutes drive to Shannon Beach public swimming beach & close to public boat launch. See more info at BIGRob.ca including our virtual tour video & drone overview then Call Rob McKibbon for your personal viewing appointment! Shows easily too. 250-804-6288 or SOLD@BIGRob.ca. Thanks for your interest!